That would mean that I could list this school first, but my four back up choices would have to be in that municipality too. Problem is, only two of them are within walking distance so if those are full I might then end up in a school which is actually far away. Living in the school’s catchment area is apparently the second biggest points-earner, after having a sibling at the school. You get fewer points in a neighbouring catchment area, and none if you are outside the school’s municipality. However, staff at another school told me that in theory there is no obstacle to listing schools from two municipalities on your application, but in practice the administrative side doesn’t work well, as the municipalities don’t always collaborate well together. Now that’s no surprise. The schools in my municipality introduce English as a foreign language at varying ages (some in preschool, others from 6 years old) and a couple are centros bilingües meaning they teach a few of subjects in English (like social studies, art and physical education) from a certain age. The school across the border also begins French at age 10-ish. The schools confirmed that I’d be able to get the application form from them on the first working day in March (job done) and the deadline is at the end of the month. Looking at it now, the list of requirements isn’t difficult to meet. 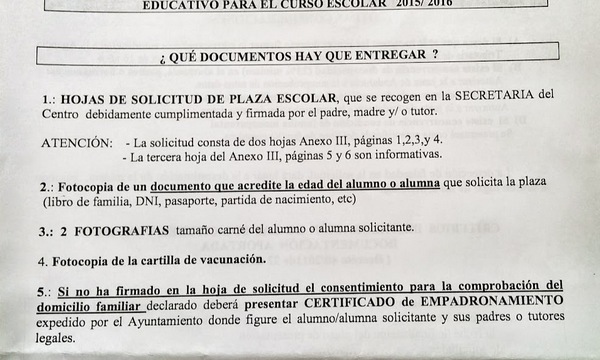 I don’t need a sworn translation of her partida de nacimiento (birth certificate) which is in English because they’ll accept a photocopy of the passport as is. 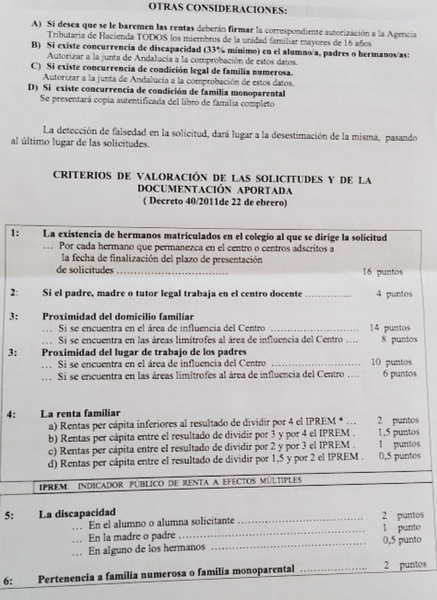 They don’t even ask for the volante de empadronamiente, just authorisation to check up on the fact that we are registered here via the Oficina de Estadística. One school said it wasn’t bothered about proof of her vaccinations being up-to-date. The other didn’t need it translated – good job as it’s in a mix of Arabic and French.